I am currently reading The Old Man and the Sea with two 16 year old Chinese high school sophomores. They are cousins. One is a “good” student, strong and sly in the self-protective way of students who know how to work the system, but do not reach the upper echelon of test results. The other is delicate and shy, a “top” student, who is being groomed to test into Beijing University, producing results (出成绩) for her school and family. The good student knows that unless she goes abroad, she will no doubt end up at Shenzhen University, no matter how much harder she works at school; fortunately, her parents can afford to send her anywhere and so she is not too sly, and her eagerness to model good student answers quickly gives way to assertive self-confidence. The top student already struggles with contradictory desires and ambitions. She yearns to study abroad, but her homeroom teacher has already begun pressuring her to stop studying for the TOEFL and to use her extra time more productively — taking practice gaokao tests or studying the junior year high school curriculum. What’s more, the child of divorce she knows that her mother can’t afford Chinese tuitions, let alone foreign and thus she must secure a scholarship wherever she attends university. We sit around a square table, tracking the relationship between the old man and the marlin. Santiago believes that his fish is out there, and his quest begins when he sights the purposeful circling of a man-of-war bird. His faith is rewarded and the contest engaged. As the fish pulls the man further out to sea, away from from the lights of Havana and known landmarks, the old man endures, charts his progress against the stars and his suffering, and the fish becomes more than a fish — first a friend, then a brother, more noble, but less intelligent, a brother who must be convinced that he is less than he who came to kill. It is a grand battle that does not end in glory, but the realization of hubris, “I shouldn’t have gone out so far, fish,” the old man says to the marlin’s corpse, which has been strapped to the skiff and is being inexorably eaten by sharks. When the old man finally drifts ashore, all that remains is an 18 foot skeleton and the certainty of death. 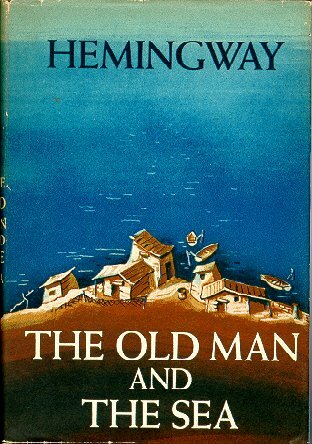 I chose The Old Man and the Sea because, well misgivings about Hemingway notwithstanding, he knew his craft. His language is deceptively simple. Any sentence taken out of context seems ordinary, common even, but together his words sculpt moral landscapes that make exquisitely salient the brute masculinity and ultimately tragic consequences of lives lived against nature. “Americans aren’t very peace-loving,” the good student concludes. “Did the old man have faith in luck or faith in the sea?” the top student asks. Thus, yesterday’s lesson transformed from a discussion about human limits into a conversation about how being human is culturally defined and experienced. The old man is not their old man, his fish is not their fish, and the sea that relentlessly pulls us out of our depth, that tests our forbearance and ultimately claims our soul, that sea does not figure their dreams. It may be a generational difference. But perhaps not. Certainly the new US passport is replete with pictures of men taking on nature — cowboys and seamen ruggedly occupying the western plains and Pacific waves, respectively. And that’s the point: the girls read with me because the good student’s mother is a friend and she has entrusted her daughter to me (and yes those words were used “交给你”) for old-fashioned Chinese purpose: edification rather than simple instruction. The goal of our bi-weekly meetings is not to improve English test scores or practice oral English, but rather close reading of novels, essays and poetry, to help the teenagers learn to navigate literary nuance elsewhere, which it turns out is also learning to simultaneously recognize oneself and one’s Other despite and across epic difference, which isn’t quite what Hemingway had in mind when he figured Man through his engagement with the Fish, but nevertheless where yesterday’s lesson ended. This entry was posted in noted and tagged cosmography, cross cultural misunderstanding, education, exegesis, gaokao, hemmingway, houhai, man against nature, musing, shenzhen, the old man and the sea. Bookmark the permalink. ← early edition vs weibo: who are you reading on the way to work? I love this entry!! wish you had been my teacher when I was 16. Thank you for explaining so well this wonderful story. I have just come back from China, where i read the book. It was the first time I read Hemingway in English and, as you described beatifully, I am deeply moved by the simplicity of his language and the deepness of his meaning. See you soon in China! Hi Javier, happy to hear from you. I have been following your Chinese adventures through Miguel’s wonderful essays. I too look forward to meeting again.